The aloe family of plants includes over 200 varieties. Of these it is the Aloe Barbadensis Miller(Aloe Vera) that has been of most use to man. A succulent plant with thick fleshy leaves which conceal an inner gel, it has been used for centuries to maintain health and enhance beauty. Flourishing in warm, dry climates, both the Egyptians and the Greeks valed it highly. Aloe has been improving health for generations - it is tried and tested. It is versatile as it can be taken as a drink or applied to the skin. Known since the beginning of recorded history as one of the most benficial plants on earth, aloe vera contains over 75 known active ingredients (and probably many more). Also included are 19 of the 20 amino acids required by the human body and 7 of the 8 essential amino acids ( that the body cannot make) , as well as vitamins and minerals. 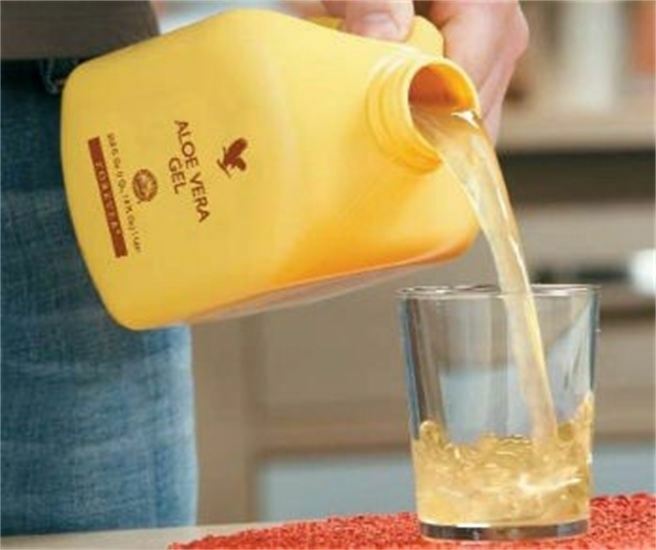 It is an ideal carrier for nutrients (encouraging better absorption) for the key ingredients in aloe drinks. Let the legendary power of aloe vera change your life from inside out. We are the world's largest growers and producers of aloe vera and have a patented stabilisation process ensuring our aloe is essentially identical to the inner leaf gel - providing maximum health benefits. Our aloe is also free from herbicides and pesticides and is not pasteurised. Aloe Vera is our number one ingredient. We don't simply add a few drops, we start with 100% inner gel and combine just enough other ingredients to keep it fresh. We only use the inner leaf, so we've no need to filter out the inedible ingredients of the rind. This leaves the natural balance of nutrients undisturbed. Our stabilised gel has been declared as "essentially identical"* to the raw gel (* Food and Drug Laboratories of New York). In other words, drinking our aloe vera is like breaking open a leaf and scooping out the gel! Most shop bought aloe vera, as juices and tablets rather than a drinking gel, often contain far less aloe vera than their advertising would suggest. Proof magazine stated that Forever's "Aloe Vera Gel made up 97 - 98% of the content" and therefore voted it "best aloe vera juice" and gave it their best buy recommendation. We are in complete control of the manufacture and distribution of our aloe products - you can feel confident that everything is quality assured. Our recyclable three-layer bottle protects the integrity and potency of our aloe so that you receive it in tip-top condition, just as it was sealed at our factory. the long chain of polysaccharide in aloe vera acemannan is very delicate and therefore the manufacturing process should be as gentle as possible. Our patented cold stabilisation process, which does not involve either excessive filtration, concentration or excessive heat, leaves this sugar in the same state as it was in the plant. The acemannan is not broken up by these processes which often occur in the whole leaf method of extraction. Therefore, the aloe vera gel, if taken on an empty stomach, will not be exposed to the damaging effects of the stomach juices because ot passes through very quickly into the small bowel wher it is absorped unchanged which then has the maximum effect on the immune system. The ideal polysaccharide in any product should be 1200 - 1400mg/litre and our aloe meets or exceeds this level. Many of our competitors use the whole leaf manufacturing process involving harvesting the whole plant rather than the individual leaves, where leaves and rind are first pulped then filtered to remove unwanted products such as the rind and sap of the plant, often called bitter aloes or aloin. The final filtration to extract the aloin is through a carbon filter which is extremely efficient but it may be extracting other unknown beneficial ingredients. Occasionally the whole leaf system is used to make tablets resulting in even more interference with the natural ingredients. Poor diet, stress, caffeine, alcohol and convenience foods etc can all lead to less than perfect health. Aloe has a wealth of micro nutrients, its effect on the immune system has proved it to be one of the most important everyday supplements available. Aloe Vera is so versatile - see our wide range including drinks, nutrition, skincare, personal care and cosmetics.